Truth be told, I have never actually tailgated before. I’m sure this is partly due to the fact that I also don’t watch football. However, when the Arkansas Razorbacks play in Little Rock, tailgating takes up a good part of the town, as well as the local twitter, instagram and facebook feeds. So in honor of the Razorbacks playing this Saturday in Little Rock, Whitney and I have put together The Perfect Tailgate Menu. 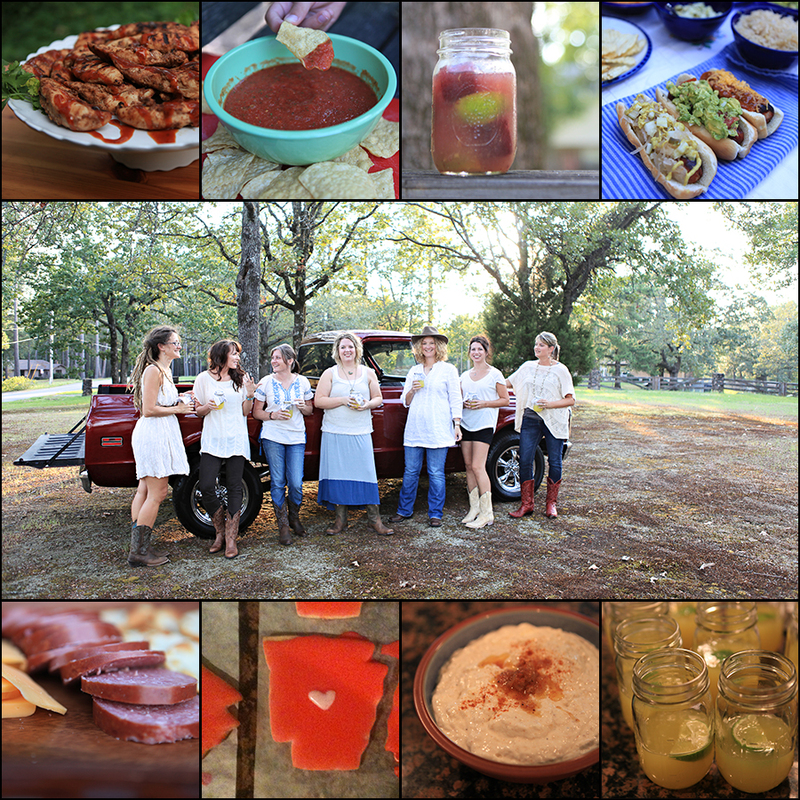 And if you are not tailgating this weekend, you can adapt this yummy menu to any gathering of friends. You only need one or two friends around to have an excuse for making homemade margaritas, right? There is nothing quite so yummy to me as a margarita with fresh lime juice. Whitney and I frequently drive all the way across the river to have Arkansas’ Best Margarita at ZaZa’s because it is made with fresh juices, but if you want to squeeze a whole bag of limes, you can have a pitcher of the best margarita at home. So grab a bag of limes, some Petit Jean meats and more than one bag of chips because it’s not about whether the Razorbacks win or lose. To me, it’s all about the food. Recipes for onion dip and margaritas are below. All other recipes are linked! Happy Tailgating! Mix all ingredients (except salt) and chill until serving time. Summer sausage and hot dogs for The Perfect Tailgate Menu were provided by Petit Jean Meats, a local Arkansas company. I’ve been using Petit Jean Meats for a long time, as my mother would send me back to the store if I brought any other brand of bacon in her house, so partnering with them is a pleasure! In fact, soon I will be getting to give away a Petit Jean Thanksgiving Ham here on the blog. Awesome tailgating picture provided by Whitney Loibner, truck was loaned to us by our sweet friend Jeremy Jeffery, and all our boots are courtesy of Country Outfitter. Gals pictured are all Arkansas Bloggers who are game for any kind of gathering that includes boots and tequila.